Christmas cards are staring to roll in, so what to do with them? This is my conundrum every year it seems. I don't want to spend money on some card-displaying apparatus that I'm then going to have to find a place to store the other eleven months of the year. I've tried putting tape donuts on the backs of the cards and sticking them to wide ribbons hung vertically. That looked nice, but the tape lost it's gumption and they soon started falling off. I've tried displaying them along the bottom of my hutch like I do our birthday cards, but since so many people send photo cards that don't actually open, this didn't work well either. Then, one year I just stuck them all in a basket, but then I couldn't see all the beautiful smiling faces, so I was unhappy with this solution as well. This year, I'm trying something new and I really like it. Using twine we already had, I strung three pieces of twine across the front of our hutch and am clothes-pinning the cards to the twine. Now, if you don't already have a hutch this solution will prove very expensive for you, so I wouldn't recommend it. But! If you already have a hutch (or similar type piece of furniture) give it a try. A couple things to keep in mind...once you string these up, it will be very difficult to open your hutch doors. I pulled out the items I knew I'd use between now and late January and put them below the hutch or up on top. You also don't want to use tape on the face of your hutch in case it leaves residue or effects your finish or paint. The way I worked around this was to thread the twine around the hinges, tying them off for the top and bottom rows. 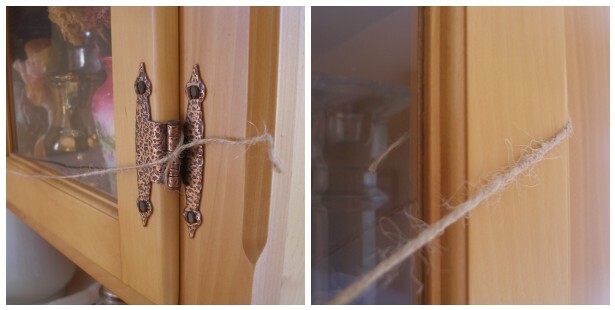 For the center row, I threaded the twine between the door and front frame and taped the end to the inside of the door. You can hang as many rows as you think cards will come your way. Since our hutch sits the end of our dining room table (where we eat all our meals), the lovely cards will be in plain view for us to enjoy. I do this above my doorways in the house (and bigger windows). Last year I put little nails in the top of my window moldings (so it's hanging over/outside the windows). This year I simply had to hang new twine and pull out the clothepins I already owned. In this way the kids also don't have access to messing with them. I slip mine between the slats of the blinds in the window. Learned this from my MIL after years of struggling to keep them from falling down. Works great! Either paper clip the photos to the blinds or stick them to the bulletin board. Very clever idea! I like the "homespunness" of the twine and clothes pins. We used to do this on our hutch when we lived in Topton! This year I cleared off one of James's art display boards (the boards with ribbons to hold pictures, notes, etc) and am displaying our cards that way. Nice work Little Miss Crafty Pants. :) How is Mir's stocking coming along? Your idea is so wonderful and looks great! In years past I would pin the cards we received to a ribbon hung up with a wreath hanger over our pantry door. This year, the cards are in a basket in our family room. The kids (5 and 2) love to pull the cards out repeatedly and look at them. Having the cards in an accessible place lets the kids constantly go through them. A very fun way to hang cards! If you wanted to, you could cut some strips of holiday paper to fit the clothes pins and glue them to one side. We did this for a baby shower, and it came out so cute - I bet it would work for Christmas too.